Calcium, one of the most abundant mineral in the body, is a vital nutrient that is required for muscle contraction, secretion of enzymes and hormones, blood vessel contraction and expansion, and the transmitting of impulses throughout the nervous system. About 99% of the body’s calcium is stored in the teeth and bones wherein calcium is primarily their basic structure; the remaining 1% is found in the muscles, blood and inter-cellular fluids. The body needs to have daily intake of calcium simply because aside from the usage amount of needed calcium, the body also loses calcium through urine, feces and sweat. This can be achieved relatively easily by consuming calcium rich foods such as dairy products and leafy vegetables. Recent studies have shown that calcium function can also protect colon cells from chemicals that are known to be cancer-causing. It also reduces the PMS symptoms that normally occur at the second half of the menstrual cycle and aids in preventing migraine headaches. Lack of this essential nutrient can lead to numerous fatal conditions such as rickets, which can greatly affect bone growth in children and causes bone deformities as well. Lack of calcium in adults can cause osteoporosis. Due to the high decrease of calcium level in post-menopausal women, they become particularly more prone to osteoporosis. Green leafy vegetables. These include mustard, turnip, kale, collards, and dandelion greens. Dark green leafy vegetables are high sources of calcium, cooked or raw. Collard greens have 5% RDA per cup, mustard Greens 6% RDA per cup, kale 9% RDA per cup, dandelion greens provide 103mg (10%RDA) per cup, and the best provider of calcium among these is the raw turnip greens that calcium with 105mg (10% RDA)or 190mg (19% RDA) per 100 gram serving, in a chopped cup. Cheese. The amount of calcium found in cheese is dependent on type and variety. Parmesan cheese is known to be the highest source of calcium that offers 100g serving (138% RDA) calcium; gruyere with 283mg (28% RDA) per ounce; romano cheese with 298mg (30% RDA) of calcium; cheddar, swiss, mozzarella, hard goat cheese and provolone with 212mg (21% RDA) of calcium per ounce. Milk, Yogurt and other dairy products. Full fat dairy products have slightly less calcium than low fat dairy. Whole milk provides 276mg (31% RDA) per cup; skim milk provides 306mg (31% RDA) per cup; and low fat yogurt provides calcium with 183mg (18% RDA) per 100 gram serving , which makes it the highest calcium source among dairy products. Dried herbs. In cooking, dried herbs are not used in large portions, but adding some extra pinches to soups, sauces, stews, and other dishes can surely increase the amount of calcium to one’s diet. Dried herbs include savory tops, celery seeds, dried thyme, dried dill, sage, rosemary, sisymbrium, spearmint, oregano, poppy seed, parsley, dried basil, and chervil. Sesame seeds. Roasted or dried sesame seeds can provide calcium with 989mg (99% RDA) per 100g serving. Almonds and Brazil nuts. Dried, roasted, or made into butter almonds are great sources of calcium. Almonds can deliver calcium with 266mg (27% RDA) per 100g serving. Due to the fact that Brazil nuts are known to be the largest of all nuts, and they are rich in calcium it is easy to see that they makes a fantastic source of calcium. They can provide calcium at 213mg (21% RDA) per cup or 160mg (16% RDA) per 100 gram serving. Flax seeds. Although flax seeds are known to be highly rich in omega-3 fats, they can also provide 255mg (26% RDA) of calcium per 100g serving. Whole and milled flax seeds are the providers of calcium as refined flax seeds do not contain any significant amount of calcium. Tofu. This is commonly found in Chinese food and other eastern dishes. A simple fried tofu can provide 372mg (37% RDA) per 100g serving of calcium or 48mg (5% RDA) in a typical 13 gram piece. Herring. This is a highly rich in vitamin D food, which greatly helps in the calcium absorption in the body. Herring provides calcium with 106mg (11% RDA) per fillet, or 74mg (7% RDA) of per 100 gram serving. From the above it can be seen that there are a lot of non dairy calcium rich foods available such as sesame seeds, almonds and green vegetables. For further details on the content of various foods please check out our calcium rich foods list. 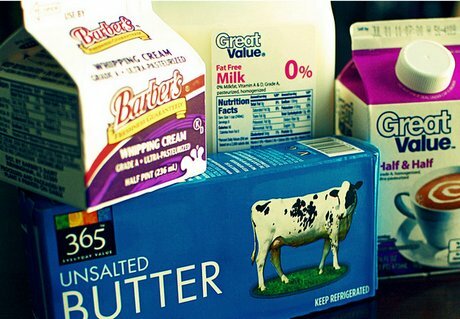 Calcium Foods Photograph: Dairy Products by JamiesRabbits. Recommended reading: Calcium Osteoporosis, Clemson Cooperative Extension, Iowa State Extension, Linus Pauling Institute; USDA list of calcium containing food.